Donald Barnard came to England from St Lucia to join the RAF as a bomber pilot. On his second tour of operations, he was shot down over northern France in September 1942. 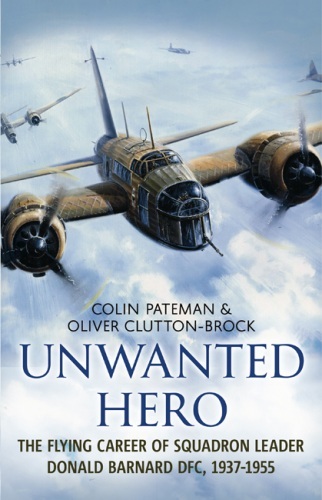 He was rewarded with the Distinguished Flying Cross whilst missing in action. Donald evaded capture; assisted to Spain by an escape network, and later compiled a detailed diary of his entire evasion exploits. Rarely has the opportunity been available to reproduce from a diary such a personal account of evasion and a unique career story supported by French resistance sources original photographs. Posted to test fly Spitfires and flying in excess of 1,000 individual aircraft, Donald Barnard then moved to the Far East to take part in supply dropping. In Burma, disapproving of the delay in recovering the emaciated allied POWs released from the terrible prisoner of war camps, he took a Dakota aircraft without authority and recovered a full complement of 25 prisoners. Flying the frail prisoners to safety for hospital treatment he returned to his unit and subsequent detention. He was later to suffer a full Court Martial resulting in his dismissal from the RAF.